A year after being acknowledged and rewarded by several watch industry prizes for its Arceau Le temps suspendu model, Hermès is launching two variations of its iconic rose gold creation. The Arceau Le temps suspendu watch conceals time and erases it from the dial whilst continuing to register its ceaseless march. This new horological complication developed exclusively for Hermès is a world first. Behind a simple and playful gesture lies a sophisticated mechanism capable of making the user forget time via a subtle play of cams, pinions and segments. The mechanics behind the illusion are created by an additional module enabling automatic and spontaneous alternation between suspended time and standard time. Protected by two patents – one for its construction and the other for the play-reducing gear teeth – this gem of horological engineering alone comprises no less than 24 jewels and is equipped with three play-reducing wheels. The running time and suspended time phases are coordinated by two synchronised column wheels, one driving the hours, and the other the minutes coupled with the date. The 360° retrograde hour and minute mechanisms make time disappear without interrupting the relentless running of the movement. Each part is hand-decorated in Switzerland with circular graining, engraving and Côtes de Genève, according to the finest watchmaking traditions. 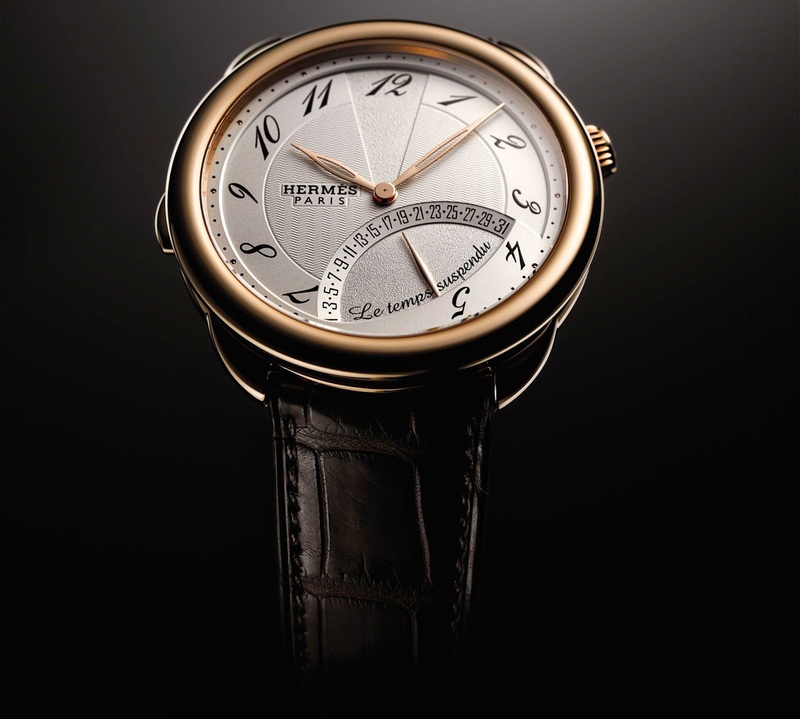 The 43 mm-diameter gold or steel case gives the watch generous scope for expression. The herring bone guilloché dial motif bears the Hermès hallmark, while the contrasting retrograde indications are enhanced by a delicately grained finish. The asymmetrical design created by the winding crown placed at 2 o’clock hints that harmony can stem from paradoxes. The rose gold model initially issued in a limited edition now comes with a choice of two dial colours: silvered or chocolate brown.